With over 800,000 copies in print, If Only He Knew by bestselling author Gary Smalley has long been esteemed as one of the premier books on marriage for men. Smalley helps men understand their wives and meet their needs in order to establish a loving, thriving relationship that will last a lifetime. Newly revised and expanded to reflect up-to-date research and the current cultural landscape for today's modern audience, this book is the perfect guide for husbands who want to love their wives and strengthen their marriages in a way like never before. Using humorous and touching illustrations from his own life, as well as case histories and biblical examples, Gary Smalley maps a blueprint to a better marriage that will have a deep and lasting impact on men and their wives. 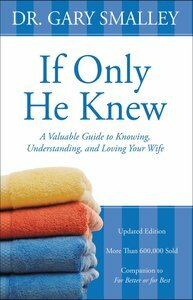 About "If Only He Knew"
Gary Smalley, one of the foremost experts on family relationships, has written or co-written 28 best-selling, award winning books selling over six millions copies, as well as several popular films and videos, based on more than 30 years of experience as a teacher, counsellor and speaker. The Blessing and The Two Sides of Love have won Gold Medallions, The Language of Love won the Angel Award as the best contribution to family life and all other titles have been top-five finalists for the Gold Medallion Award. His latest book is the DNA of Relationships. Gary and his wife, Norma, have been married for over thirty years.